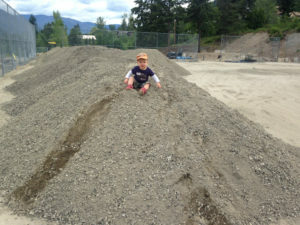 April 10th, 2019 – The big site development priority this summer is to give you a place to pee! These washrooms will be housed in a 1,400 sq ft multipurpose Facility Centre. This 2-storey structure will be tucked into the hillside just beyond, and connected to, the viewing platform. 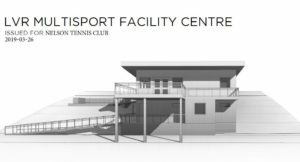 The ground floor will have washrooms and change rooms, while upstairs there will be a spacious reception area, as well as a training room for our junior program and for adult members as well. 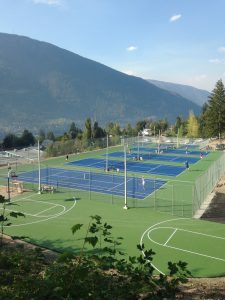 A deck, accessible from the reception room, will span the access road and extend to the top of the tennis fence allowing for serious heckling of the players below, as well as splendid views across the valley. We have already raised $100,000, with an additional $55,000 in grant applications pending. 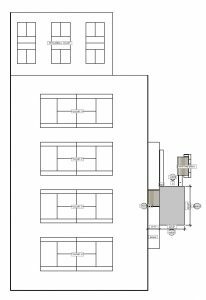 But even with our dedicated work-site volunteers and generous local suppliers, additional fundraising is crucial to achieving our 2019 goal, which at a minimum, is to get the ground floor washrooms completed and secure the rest of the building to lock-up. 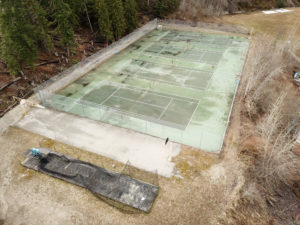 We are planning for a Community Gaming Grant in 2020 to complete the project with finishing of the Facility Centre interior, parking lot paving, and court lighting. To make this a reality, we need your help! Our fundraising campaign has officially begun and the good news is immortality can be yours! Have your name engraved on the Wall of Gratitude in the reception centre: Diamond…$5,000; Platinum…$1,000; Gold…$500; Silver…$250; Bronze…$100. Vamos gang! DONATE NOW! 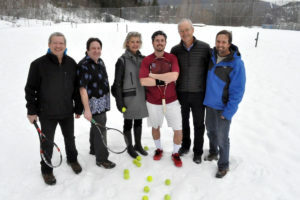 The tally will be announced at the Season Opener, Sat April 27, and the fundraiser will wind up May 3rd. Together we can git’er done! work with high performance youngsters. the School District, major funding was received from Columbia Basin Trust. 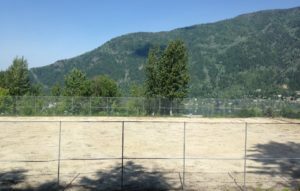 July 2nd, 2018 – The light standard footings are in and electrical is in place! Fencing on the retaining wall is complete, and the paving is not too far off. 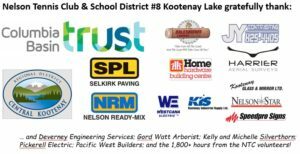 Thank you again to our volounteer work crews for putting in time on the weekends. April 16th, 2018 – The “Before” picture of our new home. Looking forward to seeing the “After”!